Now available, the second set of three pieces from the famous 12 Spanish Dances by Enrique Granados, expertly arranged by Raymond Burley. 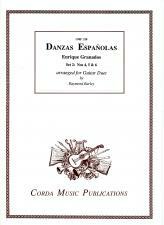 As far as can be ascertained, this is the first complete edition for guitar duet of all twelve pieces from Granados' Danzas Españolas Op.37. Arrangements of Spanish piano music represent a sizeable portion of the guitar repertory, indeed there are those who consider this to be some of the guitar's best music. Early in the last century Miguel Llobet made transcriptions (both for solo guitar and duo) of several pieces by Granados, including nos 5,6,7,10 and 11 from the Op.37 set of 12 Danzas Españolas. Although Llobet's arrangements are still available and performed quite frequently, they use effects (harmonics, étouffé and tambora, for example) that some might nowadays consider to be anachronistic. The Danzas Españolas were originally published in four sets containing three pieces each, and this guitar edition follows the same pattern.